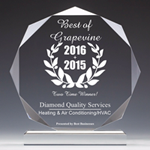 Diamond Quality Services is proud to serve the Grapevine community! About Grapevine, TX - Happy to be your hometown Heating & Air Conditioning Contractor! The city of Grapevine is located in Tarrant County, Texas, approximately twenty miles north of the Dallas/Fort Worth Metroplex. 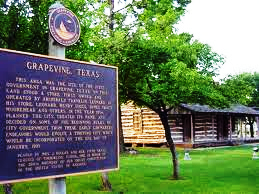 Grapevine is presently home to approximately 46,000 residents who enjoy the myriad of opportunities afforded them by the city’s convenient proximity to the cities of Dallas and Fort Worth, as well as the temperate seasonal climate that graces the region with long hot summers, moderately warm winters, and lovely mild weather during springtime and fall. Grapevine lies adjacent to Grapevine Lake, an 8,000-acre freshwater expanse maintained by the U.S. Army Corps of Engineers that offers some of the best fishing, boating, hunting, and camping in the state of Texas. The city is home to a variety of entertainment venues that include the Sea Life Aquarium, Grapevine Vintage Railroad, and the Texas Star Dinner Theater, located in Grapevine’s Historic Downtown District that features a charming assortment of shops, wineries, restaurants, and art galleries along its historic main street. Rated among CNN Money Magazine’s “Best Places to Live” in 2007, the charming and energetic city of Grapevine offers great attractions, fabulous shopping and dining, and a host of community amenities certain to appeal to residents and visitors alike!